We don't control everything; but do control many things. Through our action, we have significant influence on our future. If we blame frustrations on the uncontrollable aspects of our lives, we will be imprisoned to the pain and limited by our views. When soaking in the vastness of the surrounding big world, we feel insignificant. A seemingly meaningless cog in a giant wheel. Corporations, economies, and governments operate independent of our action; we’re forced to play along. The realness of an immense universe sends us crawling back into the comfort of distorted views of importance. At the point of complete emasculation, our mind returns to a smaller universe, the world we live in—the people we contact and the environments we control. Here we are empowered, free to make choices and improve futures. Our lives flow between two shores—the freedom of choice and the restriction of givens. Our greatest potential is achieved when we accurately differentiate between those things we control and those we do not. When we concentrate effort to change elements within our charge, we gain confidence and express true freedom. When we fight the givens, kicking against the thorns of our difficult existence, we bow helplessly before fate, quickly succumbing to our tiny existence in the enormous world that spins regardless of our beliefs, hopes, or actions. Tranquility requires facing uncontrolled adversity, withstanding the misfortune, and then acting with intention, redirecting our lives towards desired futures. We must be courageous, experiencing setbacks but continuing forward, reevaluating needs, and recalculating the course. We move the pieces within the preset rules of the game. We have choices of where we live, who we associate with, and how we spend our money. Each of these choices can widen or restrict the flow of opportunity downstream. A prolonged stretch of crummy choices constrains opportunities, severely limiting escape routes. These choices often are small imperceptible beginnings that bloom into full blown disasters. Small budgeting deficits, increase debt, increase anxiety, and progress into missed payments and bankruptcy. The small indiscretions of spending impacts credit rating, investments, and ability to secure housing. Whether our poor choices neglects relationships, hampers education, relies upon juvenile adaptations or damages health, we narrow opportunities, giving power to elements outside of our control, shifting experience from the glorious freedoms of choice to the hard levees of consequence. 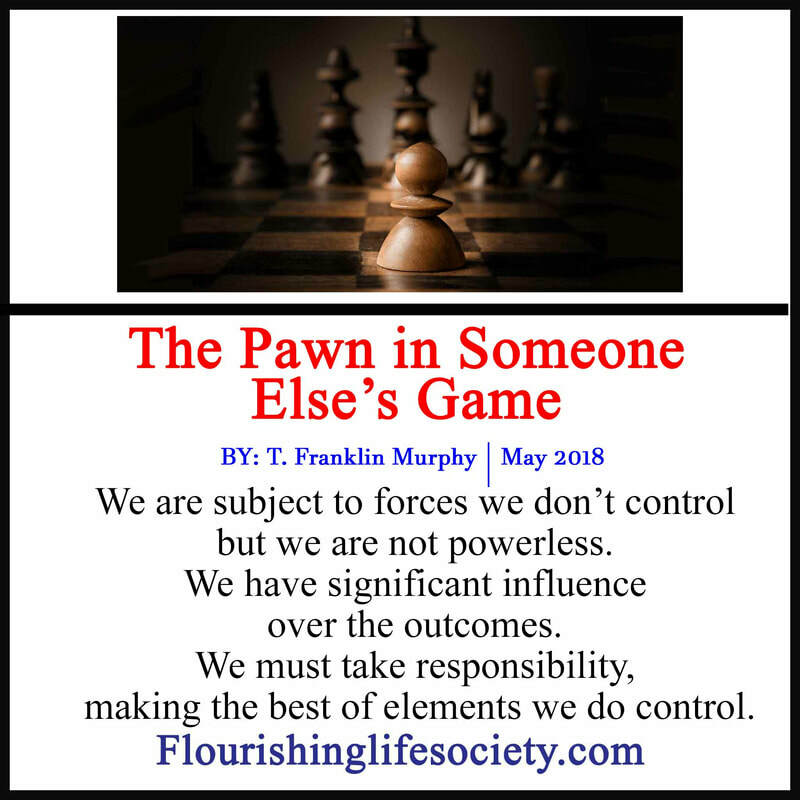 We have become the pawn in someone else’s game. "A prolonged stretch of crummy choices constrains opportunities, severely limiting escape routes. These choices often are small imperceptible beginnings that bloom into full blown disasters." Desired futures have complex sets of requirements. We can’t demand blessings without paying the cost. A potent combination of courage, skill and opportunity enables achievement. We can become more than the current trajectories of our lives. Our futures are not determined. We can seize opportunities and take destiny into our own hands. We are responsible for who we will become. We must choose the next move, and let the pieces begin to fall as they may, and then move again.